Mycobacterium tuberculosis (Mtb) is an etiological agent of tuberculosis (TB). Tuberculosis is a mounting problem worldwide. The only available vaccine BCG protects the childhood but not adulthood form of TB. Therefore, efforts are made continuously to improve the efficacy of BCG by supplementing it with other therapies. Consequently, we explored the possibility of employing Mycobacterium immunogenum (Mi) to improve BCG potential to protect against Mtb. We report here the genome mining, comparative genomics, immunological and protection studies employing strain CD11_6 of Mi. Mycobacterium immunogenum was isolated from duodenal mucosa of a celiac disease patient. The strain was whole genome sequenced and annotated for identification of virulent genes and other traits that may make it suitable as a potential vaccine candidate. Virulence profile of Mi was mapped and compared with two other reference genomes i.e. virulent Mtb strain H37Rv and vaccine strain Mycobacterium bovis (Mb) AFF2122/97. This comparative analysis revealed that Mi is less virulent, as compared to Mb and Mtb, and contains comparable number of genes encoding for the antigenic proteins that predict it as a probable vaccine candidate. Interestingly, the animals vaccinated with Mi showed significant augmentation in the generation of memory T cells and reduction in the Mtb burden. The study signifies that Mi has a potential to protect against Mtb and therefore can be a future vaccine candidate against TB. The treatment and control of tuberculosis (TB) is a growing challenge worldwide due to emerging multi-drug resistant strains of Mycobacterium tuberculosis (Mtb), failure of BCG vaccine and AIDS pandemic. BCG is a controversial vaccine since its protective efficacy varies from 0 to 85% [1–3]. Although, maximum number of people have been vaccinated with BCG worldwide, yet TB continues to afflict the global population. The vaccine protects the childhood but not adulthood manifestation of the disease. Extensive clinical trials conducted at Chengalpattu, Tamil Nadu, India suggested that BCG failed to protect TB-endemic population [4, 5]. Development of a safe and efficacious vaccine against TB has been recognized as an immediate global priority by the WHO. Alternative TB vaccines based on a BCG platform, or novel approaches to supplement BCG with agents that could enhance its efficacy, could be useful to combat TB in future. One of the many reasons for the failure of BCG vaccine is its inability to generate CD8 T cell response and to elicit long-lasting memory T cells [6, 7]. The earliest principles of vaccinology involves use of attenuated pathogens to allow its safe administration. Killed whole-cell mycobacterial vaccines may be a potential strategy for successful TB vaccine development. Seventy years ago, inactivated whole-cell mycobacterial vaccines administered in multiple-doses have shown protective efficacy in experimental models, as well as humans, but were not developed further after the discovery of BCG . A prominent example is Mycobacterium vaccae (‘Vaccae’), a heat-inactivated whole-cell vaccine against TB, which is already being approved in China for the adjunct treatment of TB . Mycobacterium immunogenum (Mi) is a non-tuberculous mycobacterium that is associated with hypersensitivity pneumonitis (HP). We did not observe any report demonstrating the role of Mi in protection against Mtb. The Mi strain CD11_6 was isolated from duodenal mucosa of a celiac disease (CD) patient. The strain was sequenced for determining its probable role in pathogenesis of CD, as microbes are known to play an important role in celiac autoimmunity [10–14]. The genomic annotations of Mi indicates that it possesses fewer virulence genes, as compared to BCG and target organism Mtb. Further, our in-silico studies indicate that it has sufficient antigenic repertoire; suggesting that it has enough potential to protect against Mtb. Sequence of Mi suggested that 16 out of total 26 peptides from Mtb showed sequence homology ranging 57–100% with similar cell surface proteins or secretory proteins of CD11_6 (Mi). Further, prior published literature suggests a probable role of Mi in eliciting immune response [15, 16]. This preliminary information had derived our interest to explore protective efficacy of Mi against Mtb. Keeping in view of above mentioned facts, we adjudged to use heat killed Mi as a vaccine candidate and check its efficacy against Mtb. The present study indicates that Mi can induce optimum activation of both CD4 T cells and CD8 T cells. Further, enhancement in the pool of memory T cells was noticed, as indicated by modulation in the expression of the memory markers CD44, CD127 and CD62L. Consequently, this signifies a possible use of Mi as a vaccine candidate against Mtb. The Mi strain designated as CD11_6 had matched with most of the phenotypic (Gram-positive, aerobic, rods in shape, acid fast, non-motile) characteristics of the genus Mycobacterium and most of the other features matched with the species M. immunogenum (Mi): negative for nitrate reduction, utilization of citrate; positive for D-glucitol, i-myo-inositol, and D-mannitol. Antimicrobial test of Mi showed susceptibility to amikacin, clarithromycin and resistant to cefoxitin, cefmetazole, ciprofloxacin, doxycycline, imipenem, sulfamethoxazole and tobramycin. 16S rRNA gene sequence showed that the strain CD11_6 correspond to the genus Mycobacterium and is most closely related to M. immunogenum CCUG 47286T (99.93% identity) followed by Mycobacterium abscessus subsp. bolletii BDT and Mycobacterium abscessus subsp. 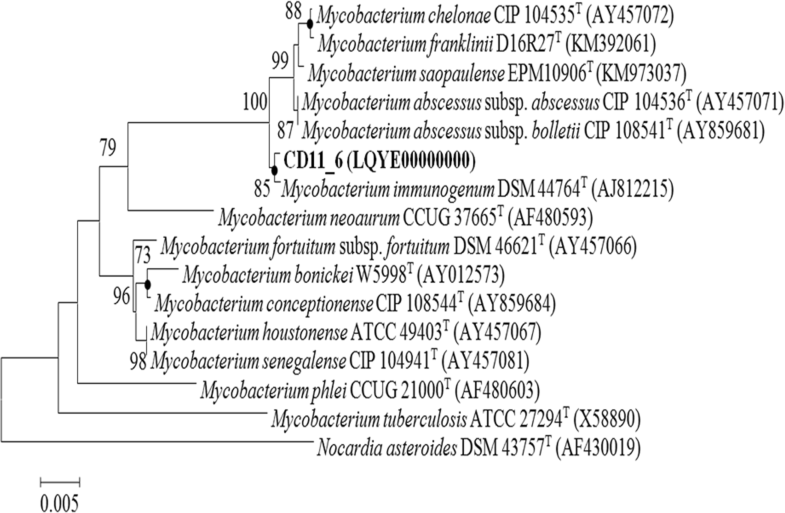 abscessus ATCC 19977T (99.56%), Mycobacterium saopaulense EPM10906T (99.49% identity), Mycobacterium franklinii CV002T (99.42% identity), Mycobacterium chelonae ATCC 35752T (99.42% identity) and Mycobacterium salmoniphilum ATCC 13758T (99.42% identity). A collective phylogenetic tree comprising of Neighbor joining (NJ), Maximum likelihood (ML) and Maximum parsimony (MP) of strain CD11_6 was constructed using the 16S rRNA gene sequences of the most closely related species for the genus Mycobacterium. Strain CD11_6 formed a separate branch with Mi DSM 44764T (Fig. 1). The draft genome of strain CD11_6 consisted of 5,272,194 bp with G + C content 64.4 mol%, 5104 predicted CDS, 398 sub-systems and 59 RNAs. The final assembly contained 35 contigs with N50 contig length of 369,643 bp and the largest contig assembled was measured 1,437,452 bp. CD11_6 (Mi) genome was the largest (5.2 Mb) among the genome of Mtb (4.3 Mb) and Mb (4.4 Mb). Both strains Mtb and Mb had 65.6% genomic G + C content whereas Mi had 64.4%. Other genome features of strain CD11_6 along with two reference genomes are shown in Table 1. By using BRIG software that works based on BLAST, a circular comparative map of whole genome was generated as concentric rings. This map shows genome sequence in the form of concentric rings. Darker areas of rings represent 100% sequence similarity with the reference genome but lighter (grey) areas represent 70% sequence similarity. Upper and lower thresholds for sequence identity were set as 90% and 70%, subsequently. BRIG based sequence analysis among three strains was carried out. Initially, genome of H37Rv-Mtb was considered as the reference and two coloured concentric rings represent comparative level of similarity in genomes of strain AFF2122/97-Mb and strain CD11_6 (Mi) (Fig. 2). 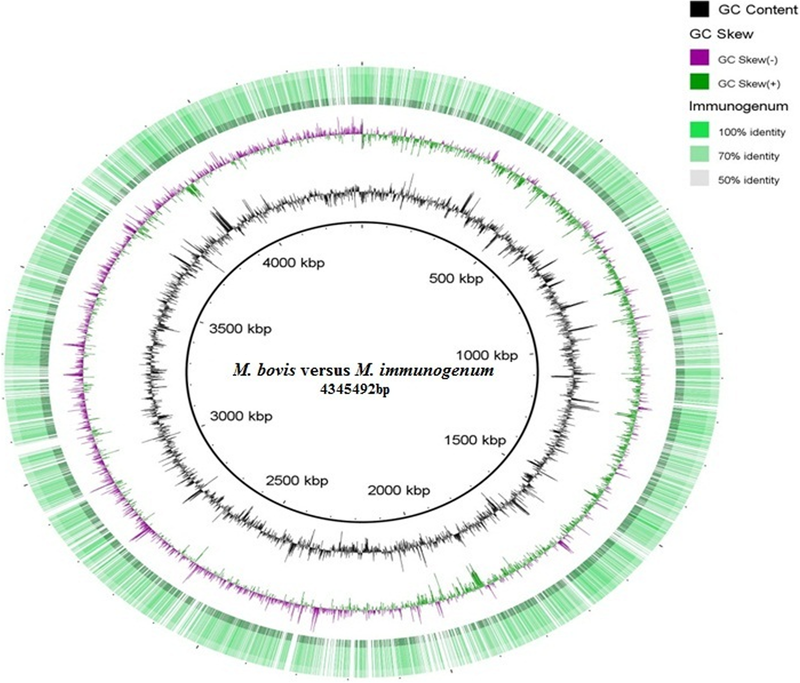 First dark blue concentric ring from centre represents genome of AFF2122/97-Mb and its sequence comparison with H37Rv-Mtb, whereas second concentric ring represents Mi and its sequence comparison with H37Rv-Mtb. Genome sequence of AFF2122/97-Mb resembles more closely with H37Rv-Mtb, as represented by the dark blue circle surrounding Mtb reference genome. However, genome sequence of Mi also shows sequence homology with genome of H37Rv-Mtb, as represented by several dark blue bands in the outermost circle. Therefore, it can be surmised that the genome of Mi may code for similar proteins like of Mtb and thus can be a potent vaccine candidate against Mtb. Similarly, Fig. 3 represents the comparative sequence analysis of strain CD11_6 (Mi), with strain AFF2122/97-Mb as a reference. Light bands in the concentric ring represent levels of dissimilarity whereas the dark coloured patches represent similarity with the reference genome. The map shows that genome sequence of Mi is very similar to that of AFF2122/97-Mb, already a vaccine strain being used against Mtb. BRIG map indicated genomic similarities but actual predictions can be attained by knowing about the coded proteins. Thus, the genomic similarities were further validated by annotating genomes of all the strains in RAST server and a comparison was established. In RAST server, genes are grouped into categories according to their major role in living systems. As per specific functions of genes, each category is divided into sub-categories which are further divisible into subsystems with a set of genes. Genome comparison of strain CD11_6 (Mi), was carried out with strains H37Rv-Mtb and AFF2122/97-Mb. The analysis revealed various categories of genes, among which virulence, disease and defence (VDD), iron acquisition and metabolism, membrane transport proteins, genes of phages, prophages and transposable elements, genes involved in stress response were further studied because of their extreme importance to evaluate the status of strain CD11_6 as a vaccine candidate. As per relevance, we studied two subcategories of VDD i.e. i] resistance to antibiotics and toxic compounds; ii] invasion and intracellular resistance. For the category VDD, a total of 66 genes were present in the three genomes. Thirty six genes were common in three genomes. Interestingly, H37Rv-Mtb and AFF2122/97-Mb had 61 genes but CD11_6 had 41 genes. Thus, CD11_6 lacks 21 virulence factor genes of category VDD, compared to other two strains but contains almost common membrane proteins with H37Rv and AFF2122/97 (Table 2). The fact is in favour of Mi as an attenuated vaccine candidate that has lesser virulence factors than the target pathogen but has comparable number of same membrane proteins like the target organism (Mtb) and the well-established vaccine strain (Mb). In addition to the common membrane proteins, the strain CD11_6 (Mi) contains 3 unique membrane proteins whereas strain AFF2122/97 (Mb) had 2 unique genes. Subcategory “invasion and intracellular resistance” of VDD is most relevant because of the membrane associated proteins responsible for virulence that can act as vaccine candidate proteins. In all 47 genes in this subcategory, H37Rv had 10 genes coding for membrane proteins (Table 2). Strain AFF2122/97 had total 9 of these genes. Strain CD11_6 (Mi) had 6 genes common with AFF2122/97 and H37Rv. Thus, CD11_6 (Mi) contains almost similar membrane proteins like the target organism and Mb. In the next sections, we predicted the potential of strain CD11_6 (Mi), as a suitable candidate for vaccination against Mtb. In this sub-category, strain H37Rv-Mtb had 48 genes, strain AFF2122/97-Mb had 46 genes and strain CD11_6 (Mi) had 27 genes. Out of total 48 genes, 27 are common in all. Unlike other two strains, CD11_6 (Mi) does not contain any gene for PPE gene cluster, mycobacterium virulence operon with PE family; ESAT-6-like proteins, and mycobacterium virulence operon in an unknown function with superoxide dismutase (Fig. 4). For all other gene functions, strain CD11_6 (Mi) had equal or less genes compared to strain H37Rv-Mtb and AFF2122/97-Mb supporting the low virulence attributes of strain CD11_6. PPE proteins, early-secreted antigen target (ESAT-6) like proteins and the 10-kDa culture filtrate protein (CFP10) are the product of region of deletion 1 (RD1) . RD1 codes for 9 genes and most of them are responsible for virulence and pathogenesis . In the sub-category, invasion and intracellular resistance, the presence of subsystem mycobacterium virulence operon was observed in Mtb and Mb that contains ESAT-6- like proteins (ESAT-6-like protein EsxL and ESAT-6-like protein EsxK), whereas Mi lacks such genes. During BLAST search analysis in the genomes, 6 kDa early secretory antigenic target ESAT-6 (EsxA) was also reported to be present in Mtb and Mb but not in Mi. These associated genes are responsible for virulence in Mtb . The presence of CFP-10 was observed both in Mtb and Mb but not in Mi. The lack of such genes in Mi validates it even safer than Mb. Genes responsible for resistance to antibiotics and toxic compounds enable organisms to survive in adverse clinical environments. Strain CD11_6 (Mi) encoded 14 genes, H37Rv-Mtb had 13 genes and AFF2122/97-Mb had 11 genes in this subcategory (Fig. 5). Like other strains, CD11_6 possess same 2 genes that can cause resistance to fluoroquinolones. CD11_6 (Mi) had 4 genes that can be responsible for resistance against beta-lactam antibiotics and 3 of these genes were also common in other 2 strains. 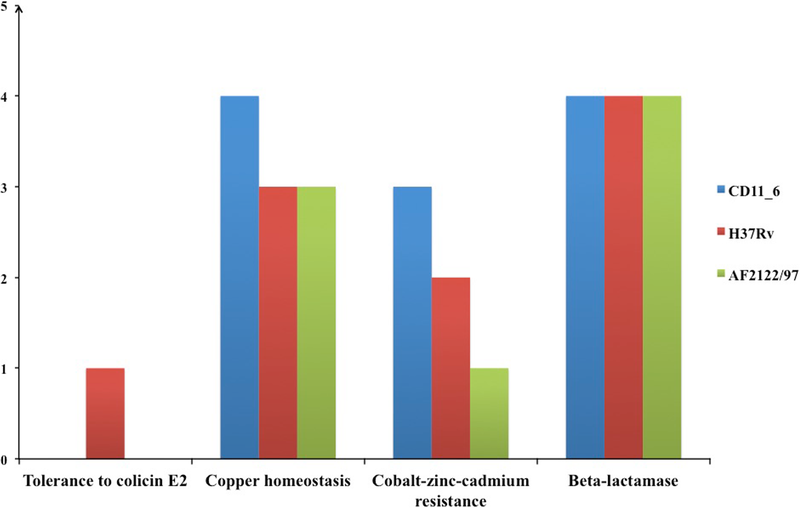 Gene coding for metal-dependent hydrolases of the beta-lactamase superfamily III is unique in CD11_6, whereas gene coding for enzyme beta-lactamase class A was absent in CD11_6, but common in strains AFF2122/97-Mb and H37Rv-Mtb. Immunization potential of strain CD11_6 (Mi) against H37Rv-Mtb was predicted using computational approaches. Twenty six vaccine candidate peptides as described by Carolina Vizcaino et.al. were considered for our in-silico comparisons . These peptides belonged to membrane proteins or secretory proteins in different strains of Mtb. Sixteen of these 26 peptides showed sequence homology ranging 57–100% with similar cell surface proteins or secretory proteins of CD11_6 (Mi) (Table 3). Our previous data showed that CD11_6 (Mi) and H37Rv have similar membrane proteins. In this section, similarity percentages indicate that the proteins encoded by strain CD11_6 (Mi) also contains similar vaccine peptides like those derived from different strains of H37Rv-Mtb by Carolina Vizcaino et.al. These sequence homology data may support the potential of strain CD11_6 (Mi) as a vaccine candidate against Mtb. Both memory CD4 T cells and CD8 T cells play a fundamental role in protection against intracellular pathogens like Mtb [21, 22]. CD44hi, CD62Lhi and CD127hi are known to be key molecules displayed on the surface of memory T cells . 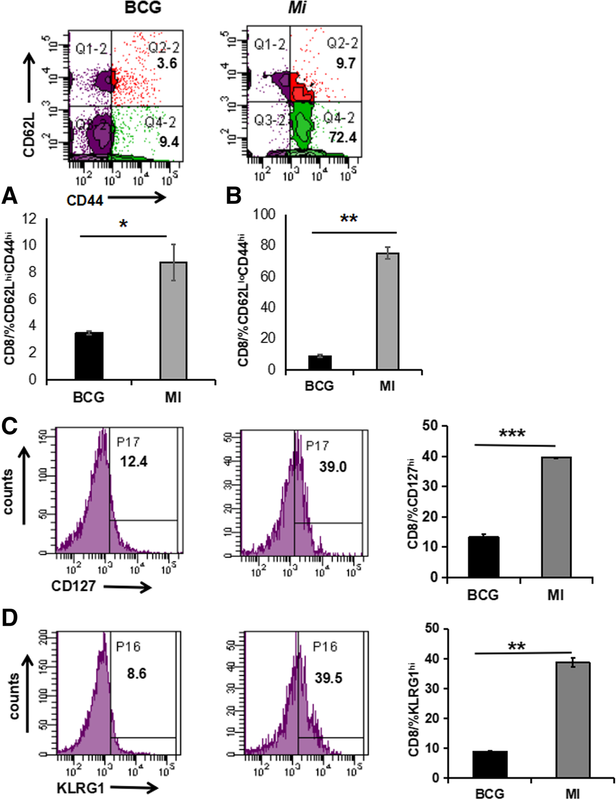 As compared to BCG, we observed that the cells obtained from the animals exposed to Mi exhibited significant enhancement in the percentage of CD62LhiCD44hi, CD62LloCD44hi (p < 0.0005), CD127hi (p < 0.05) and expressing CD4 T cells (Fig. 6), thus indicating that Mi induces the generation of central and effector memory CD4 T cells. CD62LhiCD44hi phenotype represents central memory, whereas CD62LloCD44hi population represents effector memory . CD4 T cells play a cardinal role in maintaining enduring protection against infection. BCG is known to induce diminished frequency of memory T cells which may be one of the reasons for its failure to impart long-lasting protection against Mtb . These results suggest an important role of Mi in elicitation of memory CD4 T cells. It has been demonstrated that β2-microglobulin knock-out mice, which are deficient in MHC class I molecules die rapidly of Mtb infection, thus signifying a crucial role of CD8 T cells in protection against Mtb [25–27]. Therefore, we next monitored the expansion in the pool of memory CD8 T cells in the animals immunized with Mi. Interestingly, in the case of CD8 T cells, both effector (CD62LloCD44hi) and central memory (CD62LhiCD44hi) responses were significantly increased in Mi immunized animals as compared to animals immunized with BCG (Fig. 7). Further, a significant increase (p < 0.0005) in the percentage of CD127hi expressing CD8 T cells was also observed in Mi immunized animals. Evidence supports the fact that expression of CD127 on CD8 T cells indicates a subset of effector CD8 T cells that successfully develop into fully protective memory. The combination of surface staining for CD127 and CD62L further separates between two functionally distinct memory cell subsets, central memory T cells (CD127hi and CD62Lhi) and peripheral effector memory T cells (CD127hi and CD62Llo) [28, 29]. The phenotype observed in the Mi immunized CD8 T cells is an indicative of central memory, the cells responsible for long-term protection. Immunization with Mi also resulted in significantly (p < 0.005) increased percentage of KLRG1hi expressing CD8 T cells, as compared to BCG (Fig. 7). KLRG1 is an established marker associated with activated killer CD8 T cells . CD8+ T cells generated against HIV and Epstein-Barr virus have been shown to have KLRG1hi expression, thus demonstrating a potential role of Mi in elicitation of CD8 T cells with killer ability . Such cells may be beneficial in sensing and liberating the Mtb hidden in the macrophages and providing opportunity to activated macrophages to phagocytose and kill it. Furthermore, we observed decline in the Mtb burden in the lungs and spleen of the animals that were vaccinated with Mi, when compared with placebo (PBS) group. Insignificant change was observed with BCG (Fig. 8). Overall, the results reveal that immunization with Mi elicits memory T cell response better than BCG. TB is declared as a global emergency in the wake of emergence of multidrug resistance of Mtb, AIDS-pandemic and non-compliance of BCG vaccine [32–34]. Annually, Mtb infects 9 million individuals and kills approximately 2 million people. To control TB epidemic, we require urgent and effective prophylactic and/or therapeutic vaccination strategies. Several clinical trials over the years have shown the inadequacy and inconsistency of BCG vaccine worldwide . Additionally, owing to poor efficacy of BCG in TB endemic areas, there is an urgent requisite to develop a new vaccine against TB [5, 6]. This exigency can be evidenced by the fact that currently there are 14 vaccines in clinical trials. Four of them viz Ad5Ag85A, MVA85A, ChAdOx1.85AMVA85A and MVA85A-IMX313 are in phase I trials; six: RUTI, H56/H4+ IC31, TB/FLU-04 L, ID93 + GLA-SE and MTBVAC are in phase II trials; three: VPM1002, DAR-901 and M72 + AS01E are in phase IIb trials and one: M. vaccae in a phase III clinical trial [36, 37]. Several efforts are underway for the development of a novel vaccine candidate to replace BCG or boost its efficacy. Live attenuated or killed whole-cell vaccines (WCVs) against Mtb exhibit several advantages over protein adjuvant formulations and recombinant vaccines. WCVs possess broad antigen composition, which includes the complete protein repertoire, lipids, carbohydrates, and other moieties that may elicit immune response and protect against Mtb. Live WCVs induce long-lasting immunological memory and have shown great success against diseases like measles, small pox, yellow fever, polio, etc. Therefore, live attenuated vaccines against TB may offer promising results. In a pursuit for a vaccine that can impart protection against Mtb, we did whole genome sequencing, annotation and analysis of Mi to evaluate its safety and suitability for considering it as a vaccine candidate against Mtb. The virulence status of the Mi was checked and compared with Mtb and Mb by analyzing differences in the genes belonging to VDD in RAST server. Interestingly, Mi contains lesser number of virulent genes as compared to Mtb and Mb. In addition, it has antigenic proteins similar to Mtb. Further, 16 vaccine candidate peptides have been predicted from CD11_6 (Mi), making it a suitable vaccine candidate against Mtb. Live Mi is known to induce abscess, hence we have used heat killed Mi. In addition, HK Mi induced significantly better generation of both memory CD4 T cells and CD8 T cells [Figs. 6 and 7], which is a fundamental attribute of a successful vaccine. In contrast, main failure of BCG is its inefficiency to induce enduring memory T cells and therefore its potency to protect against TB wanes with age in the vaccinated population . Intriguingly, immunization with Mi in the experimental model of TB significantly augmented the generation of central and effector memory response in CD4 and CD8 T cells, as evinced by CD62LhiCD44hi and CD62LloCD44hi, phenotype respectively. The memory CD4 T cells and CD8 T cells are known to play a fundamental role in maintaining the enduring immunity and protection against Mtb. Elicitation of memory CD4 T cells and CD8 T cells by Mi may overcome this snag associated with BCG. As compared to placebo group, we observed decline in the Mtb load in the lungs and spleen of the mice vaccinated with Mi. Based on the memory T cell data, we expect better reduction in Mtb growth by Mi. Contrary to our belief, no significant difference was observed in the Mtb burden between Mi and BCG immunized groups. Currently, it is difficult to explain this discrepancy. However, our laboratory is extensively working to bolster the efficacy of Mi against Mtb by changing the dose and the route of inoculation. Overall, the in-silico and in-vivo studies suggest Mi as a potential future vaccine candidate against Mtb. 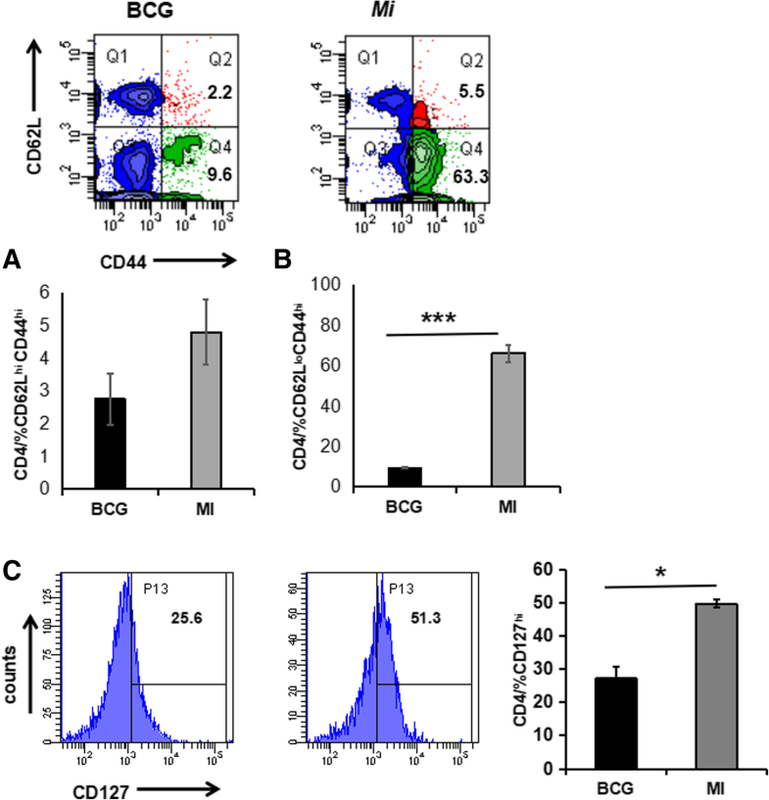 This study highlights the capability of CD11_6 strain of Mi to induce the generation of protective memory T cell response against Mtb. Using genome mining and annotation results, we depicted the presence of similar genes in Mi encoding for surface membrane antigens, membrane transport and cytosolic proteins as of Mtb. 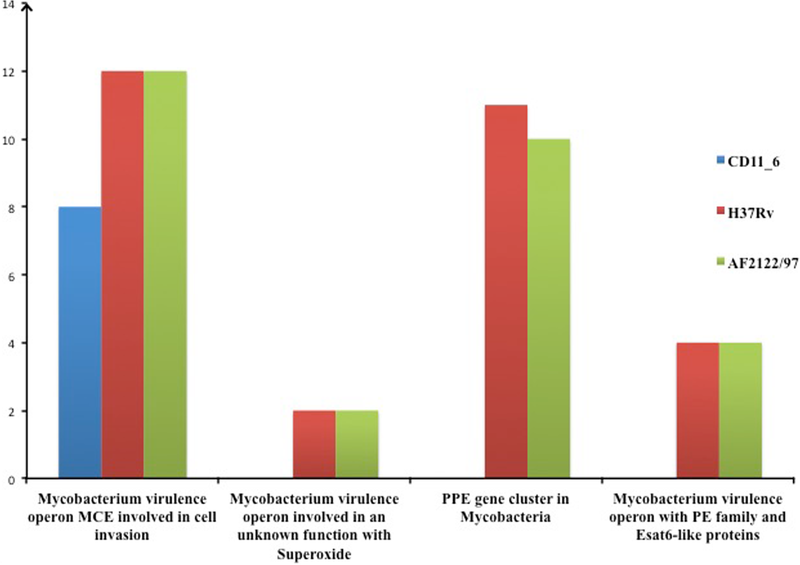 The antigenic repertoire of Mi indicated that it has enough potential to protect against Mtb. We also supported the results with in-vivo experiments; wherein we reported significant increase in the elicitation of memory CD4 T cells and CD8 T cells upon immunization of animals with Mi. In essence, the present study signifies that Mi has the ability to generate effective memory T cell response against Mtb along with eradication of Mtb from infected organs. Our results demonstrate that Mi has a potential to be used as a vaccine candidate against Mtb but extensive future studies are required to gain a deeper understanding in the mechanism of generation of memory T cell response. Strain CD11_6 was isolated from the duodenal mucosa of a CD patient. The patient was tissue transglutaminase (tTG) IgA-antibody (Ab) positive (> 100 U/ml) with abdominal pain and pain while stool passing. For a purpose to check microbial diversity in duodenum, biopsy samples were collected during endoscopy from the patient at Postgraduate Institute of Medical Education and Research, Chandigarh, India. The biopsy sample was homogenized in sterile phosphate saline (PBS) and centrifuged at 4000 rpm for 2 min to remove debris. The supernatant was serially diluted to plate on to tryptic soy agar (TSA; HiMedia, Mumbai, India) and the plates were incubated aerobically at 37 °C for 36 h. All individual colonies appearing on the TSA plates were picked and further passaged on to fresh TSA plates to obtain pure colonies. Thereafter, DNA was isolated from the cell mass of pure colonies and 16S rRNA gene sequencing was used to identify microbes. From the patient coded as CD11, total 7 microorganisms were identified, Staphylococcus haemolyticus CD11_1, Pseudomonas monteilii CD11_2, Microbacterium oleivorans CD11_3, Janibacter melonis CD11_4, Dietzia cinnemea CD11_5, Mycobacterium immunogenum CD11_6 and Methylobacterium populi CD11_7. All the strains were sequenced for the purpose of knowing their probable role in pathogenesis of CD. Genomic DNA isolation and amplification was performed as described earlier . Pairwise 16S rRNA gene sequence identity levels were measured by using EzTaxon online server . Mega version 6.0 software was used to create a phylogenetic tree as per the methods described previously [13, 40]. The reference genomes of Mtb strain H37Rv and M. bovis (Mb) strain AF2122/97 with accession numbers NC_000962.3 and NC_002945.4 respectively, were downloaded from NCBI. Illumina HiSeq 2 × 100 platform was used at C-CAMP to sequence the draft genome of strain CD11_6 (http://ccamp.res.in) next-generation genomics facility, Bengaluru, India. Library preparation and sequencing were performed according to methods described previously . CLC Genomics Workbench (v7.5.1, CLCbio, Arhus, Denmark) was used for de novo assembly. Rapid Annotation Subsystem Technology (RAST) server was used to annotate genomes [41–43]. RNAmmer 1.2 was used for identifying ribosomal RNA genes in the genomes . The tRNA and tmRNA genes were identified by ARAGORN . For identifying genome sequence similarity in three genomes, Blast Ring Image Generator (BRIG) software was employed . Comparative genomics approach is based on RAST, an automatic annotation server to predict genes involved for a given function (subsystem). Initially, Mi was compared with Mtb and then with Mb for presence of common and unique genes. The comparative data from three genomes were manually compared, as described previously . More than one person independently validated the manual comparison. As described by Vizcaino et. al., surface and secretory proteins of virulent strains of H37Rv-Mtb are sufficiently immunogenic and therefore can be exploited as a potential vaccine candidate . Similar peptides were present in Mi strain CD11_6. Surface or secreted proteins are good targets of the immune system. They are considered useful and important in vaccine design. Vizcaino et al. had described 26 vaccine peptides candidates from virulent strains of H37Rv-Mtb. For our in silico study, we had considered these 26 peptides as query sequences to search homologous epitopes in the proteome of Mi. Thus, BLAST search tool of RAST was used to explore presence or absence of such peptides in the annotated protein sequences of strain Mi. Therefore; sequence homology was determined between the vaccine peptides and proteins of strain CD11_6. The homologous peptides in predicted proteome of Mi are inferred as the peptide candidates responsible for providing protection against Mtb. All standard chemicals and reagents used in the study were purchased from Sigma (St. Louis, Mo., USA), and fluorochrome labeled Abs to CD4-FITC, CD8-APCCy7, CD44-PerCPCy5.5, CD62L-APC and KLRG1-PE were obtained from BD Biosciences (San Diego, CA), unless indicated. RPMI-1640 and FCS were purchased from GIBCO (Grand Island, NY). For culturing of cells, tissue culture grade plastic-ware was purchased from BD Biosciences (Bedford, MA). Purified protein derivative (PPD) of Mtb was prepared by standard protocols, as described elsewhere [47, 48]. Virulent Mtb strain (H37Rv) was was a kind gift from Dr. V. M. Katoch, National JALMA Institute for Leprosy and Other Mycobacterial Diseases, Agra, India. Mtb was cultured in Middle brook 7H9 broth (Difco, Sparks, MD) containing glycerol (0.2%) and Tween-80 (0.05%) supplemented with albumin, dextrose and catalase. Viability of bacteria was checked by counting the number of colony-forming units (CFU) by plating onto Middle brook 7H11 medium (Difco, Sparks, MD) supplemented with oleic acid, albumin, dextrose and catalase. Mi was cultured in nutrient broth (Himedia, Mumbai, India) at 30 °C for 48 h and number of viable bacteria were determined by plating on nutrient agar plates (Himedia, Mumbai, India). Female C57BL/6 mice (6–8 weeks) were procured from the animal facility of the CSIR-Institute of Microbial Technology, Chandigarh, India. Animals (4–5 mice/group) were immunized with heat killed M. immunogenum (HKMi) (1 × 106 bacilli/ animal). The bacteria were diluted in phospate buffered saline (PBS) and administered in animals via subcutaneous route (s.c.) on base of tail. The control groups were also included comprising of mice inoculated with BCG (positive control) and placebo PBS (negative control). After 15 days, a booster dose of Mi was administered. Later, animals were aerosol challenged with Mtb (100 CFU/mouse) after 30 days using Inhalation Exposure System (Glas-Col, LLC, Terre Haute, IN). After 45 days of infection, animals were sacrificed by cervical dislocation. The lymphocytes were isolated from lungs for immunological assays. Further, Mtb load was enumerated in the lungs and spleen by CFU counting. Lungs obtained from experimental and control mice were perfused by chilled PBS, fragmented into small pieces and digested with collagenase (2 mg/ml) for 30 min/37 °C. The RBCs were lysed with ACK lysis buffer (150 mM NH4Cl, 1 mM KHCO3 and 0.1 mM Na2EDTA, pH 7.4). The cell viability was measured by trypan blue exclusion method recorded as > 99%. The lymphocytes isolated from lungs (2 × 105 cells/well) were cultured in 96 well U-bottomed microtiter culture plates with RPMI 1640 + FCS 10% (200 μl) and purified protein derivative (PPD; 25 μg/ml) for 48 h/37 °C/5% CO2. Later, cells were harvested and washed and stained with fluorochrome labeled Abs to CD4, CD8, CD44, CD62L, CD127 and KLRG1 for 1 h/4 °C. Standard protocols of washing/incubation were followed at each stage. Samples were acquired on FACS-Aria III and analyzed using FACS DIVA software (BD Biosciences, San Jose, CA). The lung and spleen homogenates were prepared and plating was done on 7H11 agar plates with 10-fold serial dilutions. The plates were incubated at 37 °C/5% CO2 and colonies were enumerated after three weeks of incubation. 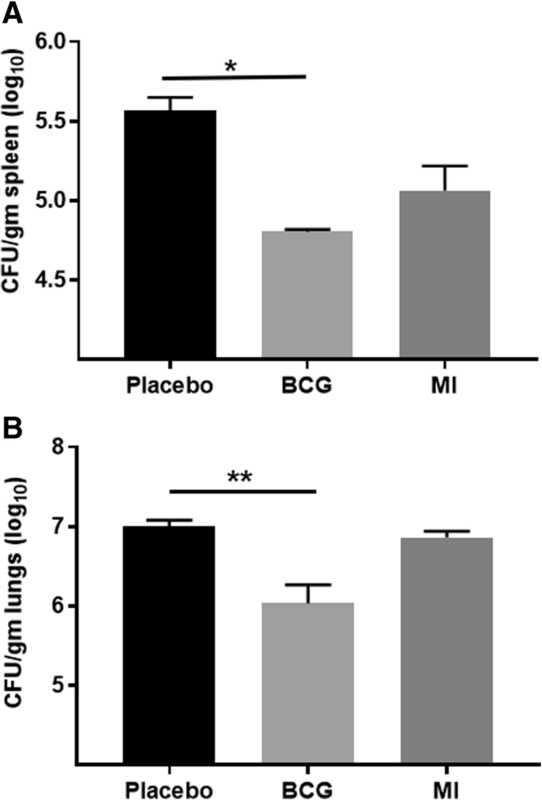 Results are expressed as log10 colony-forming units (CFUs) per gm of lung tissue. Graph Pad Prism software program was used to perform all statistical analysis. Statistical testing was performed by one way ANOVA for group analysis and Student’s t-test was used for comparing two groups. Gurpreet Kaur and Atul Munish Chander contributed equally to this work. We are thankful to the patients for participating in the study and allowing us to collect the tissues during their surgical intervention. We thank C-CAMP next generation genomics facility for help in obtaining genome sequences. This is IMTECH communication number 023/2017. We are grateful to Council of Scientific and Industrial Research (CSIR), New Delhi, India for funding network project “Man as a Super organism: Understanding the Human Microbiome” [BSC0119] and partly supported by a project, “Expansion and Modernization of Microbial Type Culture Collection and Gene Bank (MTCC)” (Grant No. BSC0402) and Department of Biotechnology (DBT), India (Grant No. BT/PR7368/INF/22/177/2012). Grant BSC0119 provided partial financial support for supplies, reagents, experimental design. Grant BSC0402 and BT/PR7368/INF/22/177/2012 supported data analyses, manuscript writing and laboratory supplies and reagents. AMC was a recipient of fellowship of Indian Council of Medical Research, GK1, SKM and GK4 of CSIR, India. The genome sequence of Mycobacterium immunogenum strain CD11_6 has been deposited at DDBJ/EMBL/GenBank under project accession number LQYE00000000. The version described in work is the first version, LQYE00000000.1. GK1, AMC, SKM, SN and GK4 performed the experiments. RK provided surgical samples; GK1, AMC, SKB, JA and SM planned and executed experiments, analyzed data and wrote manuscript. GK1, AMC, SKM and JA revised the manuscript. All authors read and approved the final manuscript. The human study protocol was approved by the Institute’s Ethics Committee of Postgraduate Institute of Medical Research and Education, Chandigarh, India. An informed written consent was obtained from the participant. CD was diagnosed based on serum IgA anti-tissue transglutaminase antibody [tTG-Ab] and duodenal biopsy suggestive of villous atrophy . The animal study and all experimental protocols were approved by the Institutional Animal Ethical Committee and Institutional Biosafety Committee of Institute of Microbial Technology, Chandigarh, India.